A remix of Schuberts “Ave Maria” by L’Oiseau Mecanique (LOM). He is one of my SequencomatV3 users and made this for a demo video of my tool. The song is not finished and got more demo charakter showing the functions of the sequencer… but I love it! I host it for him as long as he got no homepage till now. De:Bug is one of the biggest and distinguished electronic music magazines in germany. They mentioned sequencomatV3 on their website, read details here. SequencomatV3 triggers audio clips and sliced to midi beats in Ableton Live. 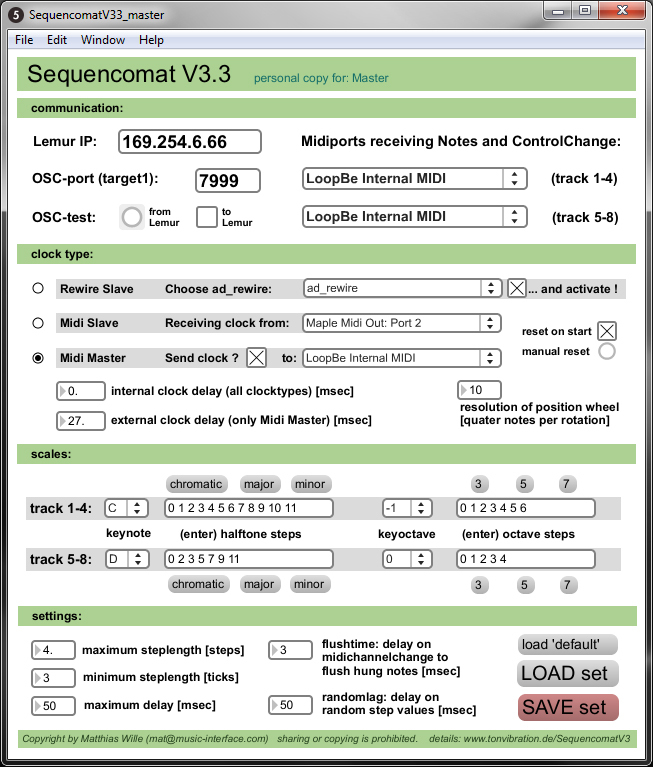 See sequencer description with screenshots here. Triggering clips in Ableton is not the main focus of this sequencer, but it is possible via midirouting. Also effect on/off or everything you can route to a keyboard… CCmodulation is done by the sequencer and feedback in MU via the m4l connection. SequencomatV3 works great with MU, but also with any other DAW or even as standalone.